It’s not that people don’t like IT and the infinitely helpful folks picking up the pieces on the other side of [email protected]<yourcompanyname.com>. It’s more that when you didn’t sign up for it, nobody wants to be them, and in an ideal world, nothing really requires their professional attention. It’s kinda like ER doctors; it’s a good day when you’re not forced to talk to one or act like one. If you’re running a small business these days, there is a decent chance that across your offices and your employees, you’ll need (or already have) a collection of Apple electronics like Macbooks, iPads and iPhones. What you don’t need, however, is to incur the lofty costs of dedicated IT resources – or endless hours of your own time – to provision, manage and secure those devices. Sure you could redirect a bunch of money and time away from marketing, design and strategy to keep all the Apples free of worms, but you might be wiser to check out something like Bushel instead. Bushel is a cleanly-designed cloud-based tool that anyone can use to manage Apple devices in the workplace without the need for a “technical” background or formal IT skillset – if you found your way to this article, you’ll probably be just fine figuring out Bushel. All the distributed devices registered within the Bushel account are visible in one simple tiled interface. From there, the user can drill into each device to manage one-off updates or easily apply company-wide configurations to all devices at once. For instance, company email settings with port numbers and mail servers and all that headache? Set it up once and have it automatically apply to all registered devices. Same thing with WiFi connectivity; store your network name and password in one central location so that any registered device can automatically connect without having to make updates and edits to each individual iPhone or iPad. Deploying apps to employees? That’s just a few clicks through an out-of-the-box integration with the the App Store. You can even reclaim apps from specific devices and reassign them to easily work around licensing caps and software budgets. 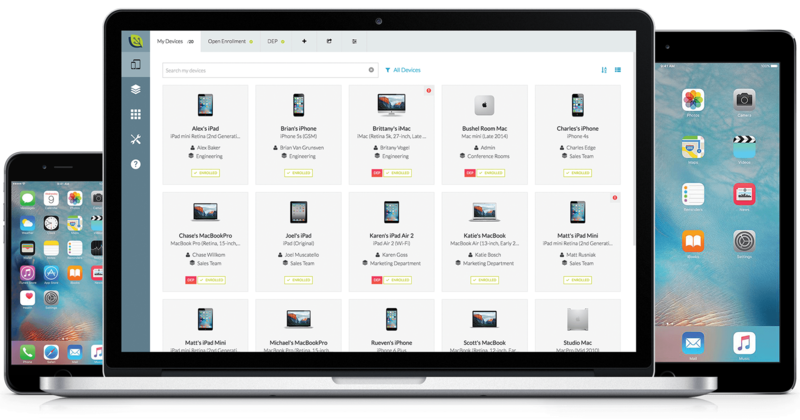 Of course, centralized security management is a huge benefit to a cloud-based mobile device management platform. At the company level, all devices can be easily configured to have password requirements and encryption. Then, at the individual device level, the administrator can remotely lock lost devices, reset passwords and even wipe all sensitive data. All from a web browser. If you’re wondering how much this all costs, there are two answers. The first answer is: a lot less than creating an IT department or taking on a second job yourself (on top of the existing six small business jobs you already fill). The second answer is: $2 per month, per device. Yes, $2. Users are not required to sign contracts or make long-term commitments; you can just use the software on a monthly basis as you need it or want it. Oh, and your first three devices are free, forever. Again, nobody is saying that solving IT issues can’t be complex. In some cases, especially once your business gets to a certain size, you’ll need someone to make a career out of it. Until then though, it makes more sense to keep it a task – one that you can do in a matter of minutes for a matter of dollars, ironically, if you set up the right software. You can get started by visiting their website. This piece has been sponsored through Syndicate Ads. Thank you for supporting the partners who support SnapMunk.